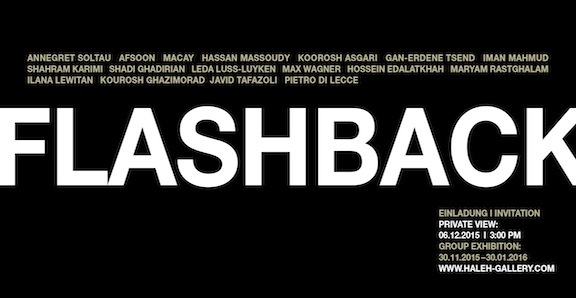 With our upcoming group show entitled FLASHBACK we look back on 5 years exhibition activity of Haleh Gallery and we want to provide for our audience an overview about the artists represented by the gallery. The exhibition presents the conceptual orientation of the gallery’s exhibition program. Our program comprises a wide selection of contemporary artists who address in their artistic works various issues within different artistic art forms. The conceptual leading thread is borders and border crossings, this topic is playing a major role in today’s society and culture. Art has always been a land without frontiers, but can be used for constable connections. Art has the potential to enter into conversation supposedly opposed cultures because it shares a common visual language. As the proverb say, a picture, or art in general, is worth a thousand words. The selection of our artists shows that despite different origins, certain issues share universal significance; they can be linked and interconnected on a level of structure and content. Leda Luss Luyken transcends within her works the borders of genre and discusses similar to the Iranian artist Shadi Ghadirian perceptions of the female. How do you define femininity? What does it mean to be a woman? Koorosh Asgari and Javad Tafazoli also depict representations of the female and investigate the motif of the veil on an aesthetic level. In this context we can proudly present the artist Annegret Soltau one of the pioneers of feminist art. Hassan Massoudy, Kourosh Ghazimorad and Maryam Rastghalam are placing emphasis in their artistic expression on traditions from Islamic art and transfer them into a modern language of form. Max Wagner and Garn-Erdene Tsends works can be seen as meditative reflexions of personal feelings and thoughts. At the same time the practice of writing establishes an artistic connection between the works of Max Wagner, Iman Mahmoud, and Hassan Massoudy whose works are experiments of form based on the traditional medium of calligraphy. These are just a few examples of the artistic interrelationships that can be seen in the exhibition. Come and see for your self the experimentation with fabric and references!